The Saigon Heat will barge into the ABL playoffs as the fifth seed after defeating San Miguel Alab Pilipinas with a narrow 81-80 victory, Sunday at the CIS Arena in Ho Chi Minh City. The Heat finish the regular season with a 14-12 record on the heels of back-to-back wins. They'll face the number four seed BTN CLS Knights Indonesia in a best-of-three contest. Trevon Hughes provided the Heat with an all-around 24 points, including five triples, six rebounds, eight assists, and four steals. Big men DeAngelo Hamilton (203-F/C-90, college: Washington St.) and Kyle Barone (203-C-89, college: Idaho) also had significant contributions with a combined 39 points and 25 rebounds. The last regular season game of Saigon and the Philippines went down the wire and was decided on free throws in the closing moments. Ray Parks knocked down a gutsy 3-pointer to give Alab a slim 80-79 lead with two minutes remaining. Barone then missed two shots at the charity stripe but redeemed himself by tying the game at 80 with a free throw in the last 25 seconds. He also came up with a huge defensive play, meeting Parks at the rim, preventing the two-time Local MVP to get a bucket on the other end. A late foul by Alab's Chris Sumalinog (188-G-89) with 1.5 seconds on the clock then allowed Hughes to troop to the line. He split his free throws but that proved to be enough to get Heat the win. Returning World Import Renaldo Balkman (203-F-84, college: S.Carolina) top-scored for Alab with 25 points to go along with eight rebounds in 33 minutes of action. Brandon Rosser (201-F, college: Cal-Riverside) was also back in the lineup and contributed 14 points and eight rebounds while Parks finished with 16 points. Towering center 7-foot-3 PJ Ramos did not play for Alab's last game. The defending champions conclude the regular season with an 18-8 record but have lost their last four games. They end up as the number two seed and will begin their title defense in the postseason against seventh-seed Hong Kong Eastern. A late rally from the Saigon Heat fell short as Hong Kong Eastern edged the visitors, 95-88, to secure their 10th win of the ASEAN Basketball League (ABL) season. Eastern's local player Siu Wing Chan (185-F-92) led the team with his ABL career-high 24 points, while shooting 71 percent from the field. Chan added three steals in the game after notching 20 markers in the first half along (17 in first quarter). Both teams started the game red hot from the field as they traded baskets, collectively shooting over 60 percent in the first two quarters. The game turned into what looked like a showdown of offensive basketball until the end where each side had only made one trip to the foul line during the first half. Saigon managed to stay close as they also scored over 20 points each in the first three periods while limiting Hong Kong to only 21 and 19 in the second and third quarters respectively, after giving up 32 in the opening 10 minutes. This effort includes a 14-2 run in the beginning of the second quarter that temporarily regained the lead for the Heat, and a 10-0 one at the end of the third quarter to cut Hong Kong's biggest lead of the game 12 points to only three going into the last 10 minutes. But a bloody nose at the end of the third that forced Heat's center Kyle Barone (203-C-89, college: Idaho) (22 points, 11 rebounds, 60 percent shooting) to leave the game early, while a minor leg injury of TreVon Hughes (185-PG-87, college: Wisconsin) that kept him on the bench for the majority of the fourth quarter that saw them struggling to match up against a deeper home squad, eventually failing to avoid their second loss in a row. Hughes did not have a great game shooting-wise as he finished with 16 points on 26 percent shooting, but his six boards and 10 dimes were critical for Saigon in their runs. On the other hand, Murphy Burnatowski (196-PF-91, college: Colgate) had 19 points on an efficient 72 percent shooting from inside the paint, while Chris Dierker (196-F, college: Madonna) added 10 points and seven rebounds. 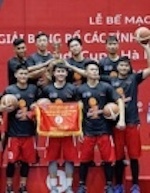 Saigon's bench also outscored Hong Kong's, 12 to three, most of which was contributed by sharpshooter Corey Cillia (eight points). On the other side, despite not being efficient from the floor, both Marcus Elliott (191-G-84, college: Louisiana Tech) and O'Darien Bassett (189-G-86, college: Troy) did wonderful things for their team in other aspects. The former World Import MVP Elliot almost had another triple double with 15 points, 10 rebounds and eight assists, while Bassett put up a double double of 22 points and 10 assists. Samuel Deguara (223-C-91) took full advantage of Barone's early foul trouble and absence later on to have a monster game with 23 points, 17 rebounds and two blocks on 78 percent shooting. Hong Kong Eastern (10-8) will look to move up from their current place at the fifth spot when they host the Macau Black Bears on the 2nd of Febuary. Meanwhile, third placed Saigon will continue their long road trip on Sunday against the defending champions San Miguel Alab Pilipinas. Thai coach Kevin Yurkus left defending champion Can Tho Catfish (VBA). He helped them to win the league title. 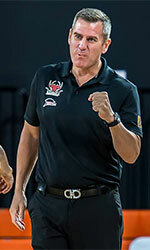 Yurkus also coached for Mekong United (TBSL) in Thailand league. He has coached previously Thailand team Mad Goat.